I am really not convinced that aliens came to Earth in ancient times and seeded cultures with the same aesthetic ideas, despite programs on NatGeo or TLC that still propose such scenarios, comparing the pyramids in Central America to those in Egypt. I prefer to rely on the idea of “simultaneous development of ideas,” finding it much more plausible that the influence of ancient Greek sculpture was transmitted to Cambodian artists by Indian artists of the Gupta period. While acquiring images of artwork from the Philadelphia Museum of Art, I came across this stunning sculpture and thought I’d show you a comparison that may have some wondering if the ancient Egyptians ever visited Southeast Asia! 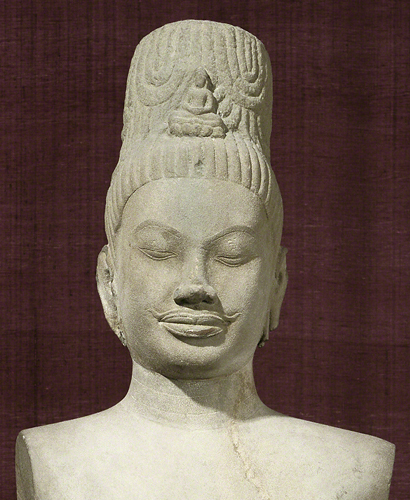 Early Cambodian art was under the influence of southern China. Cambodian art is perhaps primarily most famous for the large, holy mountain-type temples such as Angkor Wat (ca. 1100–1150). However, the sculptural style that emerged as a result of wave after wave of Indian influence is, perhaps, unique in Southeast Asia. Beginning in the third century ce, there were important contacts by sea with India. After the fourth century, monumental sculpture appeared in both Cambodia and Thailand, based initially on the Gupta style (ca. 320–647 ce). The Gupta Period style was characterized by an elegant refinement of facial features and gestures, but also a strong frontal orientation. Cambodian art ceased to evolve for all intents and purposes in the fifteenth century after Thailand military power crushed Angkor and scattered other religious communities. Hinduism and Buddhism were imported in to Cambodia at this time. There was a synthesis of Hinduism and Buddhism into a uniquely Cambodian religion called Devaraja, the cult of the God-King. Hinduism was by far the strongest influence from India. This sculpture shows the fusion of Buddhist iconography with Hindu stylistic tendencies. The head of this Buddha, with its diadem of incised decoration and pointed top knot, along with incised lines for eyes and mustache, is typical of Cambodian god figures, seen in heads of Vishnu and Siva as well. 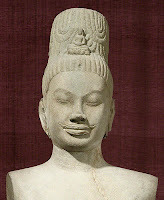 The mysterious smile on the Buddha’s face, also typical of Cambodian sculpture, is sometimes called the Angkor Smile. Compare this Buddhist figure with that of the ancient Egyptian pharaoh Menkaure, builder of one of the Great Pyramids in Giza. Although almost 3100 years separate the two sculptures, there are striking similarities with the rigid frontality, the generalized anatomy, and the placement of one leg moving forward. 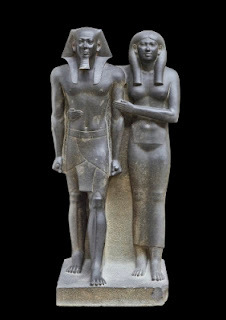 This style of male or female figure in Egypt endured for thousands of years, and was codified because such sculptures served a sacred, funerary purpose. The Cambodian Bodhisattva was more of a celebratory figure that would adorn a temple to be seen by worshipers. Activity: Stuffed sculpture. Draw a wide body shape that represents either a self-portrait or portrait of an imaginary person, making sure that it is a wide body shape. Cut around the edges. Trace the shape onto another piece of paper and cut it out, placing it under the original shape. Color in the face and clothes using markers or crayons. Close all the edges but one with glue or staples. Stuff with crumpled up paper then close the last edge.